Javid, A., Gorannevis, M., Moattar, F., Mashinchian Moradi, A., Saeeidi, P. (2013). Modeling of Benzene Adsorption in the Gas Phase on Single-Walled Carbon Nanotubes for Reducing Air Pollution. International Journal of Nanoscience and Nanotechnology, 9(4), 227-234. A. H. Javid; M. Gorannevis; F. Moattar; A. Mashinchian Moradi; P. Saeeidi. "Modeling of Benzene Adsorption in the Gas Phase on Single-Walled Carbon Nanotubes for Reducing Air Pollution". 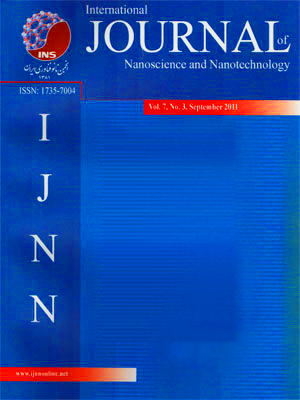 International Journal of Nanoscience and Nanotechnology, 9, 4, 2013, 227-234. Javid, A., Gorannevis, M., Moattar, F., Mashinchian Moradi, A., Saeeidi, P. (2013). 'Modeling of Benzene Adsorption in the Gas Phase on Single-Walled Carbon Nanotubes for Reducing Air Pollution', International Journal of Nanoscience and Nanotechnology, 9(4), pp. 227-234. Javid, A., Gorannevis, M., Moattar, F., Mashinchian Moradi, A., Saeeidi, P. Modeling of Benzene Adsorption in the Gas Phase on Single-Walled Carbon Nanotubes for Reducing Air Pollution. International Journal of Nanoscience and Nanotechnology, 2013; 9(4): 227-234.
energies were calculated using the B3LYP calculation method and 6-31G basic set at different time intervals. obtained as follows: For 0.5, 1, 1.5, and 2 angstrom outside the nanotube (7, 7), 14.25, 11.22, 3.32, and 0.78 electron volts (eV); for the nanotube (9, 9), -776.34, -807.12, -817.16, and -844.62 electron volts (eV); for the inside of the nanotube (7, 7), 14.66, 7.76, 7.30, and 7.27 electron volts (eV); and for the nanotube (9, 9), -813.69, -813.97, -816.68, and -819.33 electron volts (eV), respectively. As the results show, when the diameter of the nanotube increases, the energy absorption decreases. Therefore, the carbon nanotube (7, 7), which hasa smaller diameter than the carbon nanotube (9, 9), will be more effective in absorbing and removing benzene from the air.